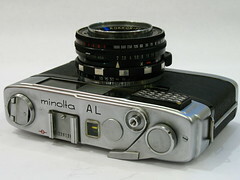 The Minolta AL was a rangefinder camera with selenium meter made by Minolta in Japan. It had a solid metal body and was sold with a dark brown leather case. All its preselection switches and rings were placed on or around the lens tube. 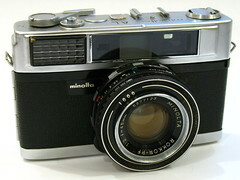 It had a viewfinder with both the superimposed rangefinder and the parallax correction coupled to the distance selection ring. The viewfinder compares favourably with that of the Yashica Electro 35 GSN by being brighter, though the AL's rangefinder patch has poorer definition/contrast (pink over light yellow/clear vs. yellow over blue). The meter's instrument had to be be read from above. 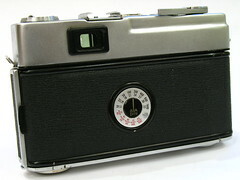 Its selenium photo cell was enlighted through a multilens window beside the rangefinder window on the frontside. The meter was coupled to the ASA selection switch, the aperture selection ring and the shutter speed selection ring. A correct aperture/shutterspeed combination was found when the meter's needle matched the mark in the instruments middle. For flash photography a scale with guide numbers helped to find an appropriate aperture/speed-combination. Due to its leaf shutter it is very quiet in operation. 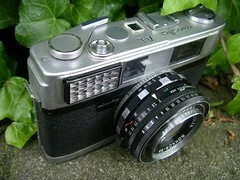 Shutter: Optiper Citizen MLT with modern speeds (i.e. 1/60 instead of 1/50 etc. ), 1 to 1/1000 sec.